I attended veterinary school at Michigan State University, graduated in 1978, and moved immediately to California with my husband. I have been in practice in Alameda County since then, and have been here at Mission Valley Veterinary Clinic since 1994. In my spare time, I have been president of the local county veterinary association, and also president of a national organization, the Association for Women Veterinarians Foundation. I currently am Awards Chair for that group. At home, I currently have 2 cats, chinchillas, birds, and fish. I enjoy seeing pocket pets (with fur) as well as dogs and cats at work. Dr. Chris Stone – Payne is a member of the House Rabbit Society. I have been a manager in the Veterinary Field since 2003 and I have been the manager at Mission Valley Veterinary Clinic since February of 2006. I am a member of the Veterinary Hospital Manager’s Association. My furry family consists of a lovable, rescued mutt Dottie and 2 wonderful cats, Lily Belle and Raisin. My love for animals and knowledge of their care continues to grow and I look forward to building on my experience with the clients and staff of Mission Valley Veterinary Clinic. I have been at Mission Valley Veterinary Clinic since November 2014. I have been working in the field for over 6 years and hold a passion for the exotic animals. Most of my veterinary experience has been in specialty and emergency care. On my spare time, I love to paint and spend time at music festivals. My future plans include visiting the Buddist Temple in Thailand and receiving my RVT license. I dream to one day work at an exotic animal and bird rehabilitation unit in Guatemala, where my family is originally from. I graduated from Carrington College in August of 2016 and received my AS degree in Veterinary Technology. I have been employed at Mission Valley since February 2016. I have been interested in animals from a very young age. I used to spend countless hours watching Animal Planet. Unfortunately, I do not have my own furry friend at the moment, but I hope to add a corgi to the family in the future. I graduated from Carrington College in May of 2014. My interest in working with animals began when I was young from helping my aunt with grooming. Being Deaf does not stop me from giving quality care that your pet needs. I aim to improve communication between the doctors and the deaf clients. During my off hours, I enjoy reading, studying Japanese and watching shows online. I am currently pursuing a career as a registered veterinary technician. I have always liked animals ever since I was a child and I am excited to finally work in a field that I love. I look forward to learning ways to help all types of animals and hopefully one day be able to run my own veterinary practice. I began working at MVVC, on a part-time basis in July of 1996. I enjoy my work very much, working with a great staff as well as interacting with our clients, as together; we care for their pets. I am very involved in training and showing my dogs in obedience, conformation, and agility. I am a member of Fremont Dog Training Club and have been their trainer for many years, I teach basic obedience to new dog owners and competition obedience to people who want to train and compete with their dogs. I am also very involved with a local agility club located at Swiss Park in Newark where I take agility lessons to prepare my dogs for competition. I am actively showing 3 dogs in obedience and agility trials and love training and competing with my k9 partners. I have been in the veterinary field since 2010 as both a veterinary technician and a receptionist. I graduated from Western Career College in 2008 where I received my AS degree in veterinary technology. I have always had a love for animals, especially cats. I have been employed with Mission Valley Veterinary Clinic since 2012 and I am grateful to be a part of this amazing family. When I am not at work enjoying our wonderful clients and their furry babies, I am at home relaxing with my hubby, our MANY crazy kitties, and our funny little dog Daxxis. My next goal is to someday get my RVT license. Until then, I look forward to meeting you and your furry, four-legged babies. I graduated from the University of California Davis with a Bachelors of Science in Animal Science. As a child, I always loved animals and I am very happy that now as an adult I am able to pursue something I am passionate about. As a Spanish speaker, I hope to lower the language barrier in the Veterinary field by providing a way of communication between our doctors and our Spanish speaking clients. 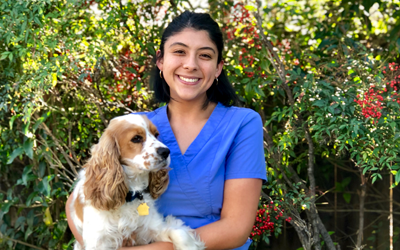 I have been with Mission Valley Veterinary clinic since June 2018, and although I am a fairly new member to the team, I am excited to meet and take care of all the furry friends that come to the clinic.